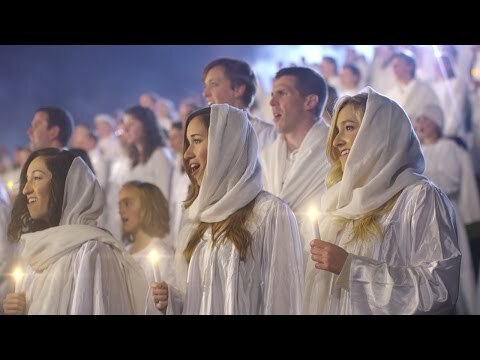 A YouTube video was released Friday morning on The Piano Guys' Facebook page featuring a musical collaboration between several artists and footage from the world's largest Nativity scene. The video begins by showing The Piano Guys, David Archuleta and Peter Hollens performing "Angels From the Realm of Glory." Many other YouTube stars including Alex Boye, Cute Girl Hairstyles, Shaytards, Devin Graham and Stuart Edge are then shown putting on their own live Nativity with young children. Just as the camera focuses in on that manger scene, the footage switches to the manger scene that took place at the record-breaking live Nativity event on Dec. 1 in Provo, produced by the Radiant Foundation. Fans can download a free copy of "Angels From the Realm of Glory" by going to the Mormon Channel Facebook page and entering a valid email address and sharing the post on either Facebook or Twitter.